The Oscar-winning musician had an apt reply for netizens who accused him of forcing his daughter to wear the veil. Hyderabad: From Oscar nominations, wins and timeless music, AR Rahman continues to add feathers in his cap. Recently the music composer celebrated the 10-year-anniversary of his Oscar-winning Slumdog Millionaire album. At the celebratory event, his daughter Khatija Rahman delivered an emotional speech. Dressed in a saree and niqab, his eldest daughter told him, "With all due respect the world sees you for your awards and accomplishments but for me, the most important thing that you have done as the father is the values you have taught us. Your humility matters the most to me." 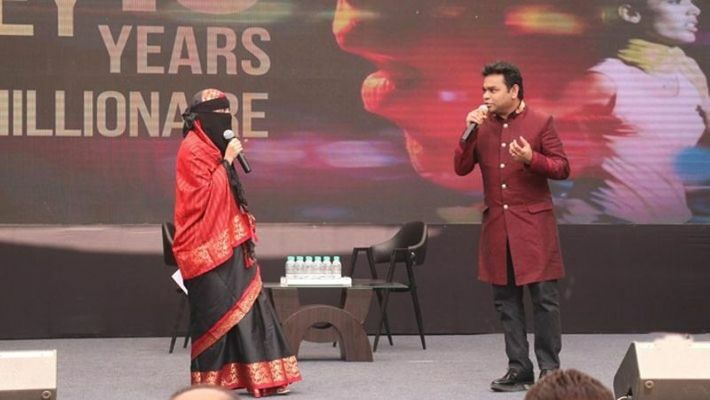 The emotional speech moved many but soon trolls descended on the father-daughter duo, accusing Rahman of being a 'hypocrite' and forcing his daughter to dress conservatively complete with a face-covering niqab. However, the musician responded to the controversy in his trademark cool way with a tweet and the hashtag #freedomtochoose. The photograph showed his daughters dressed up in different styles. While Raheema and Sairaa wore salwar kameez, Khatija wore a burqa to the event. Khatija also took to Facebook to address these accusations writing, "I'm a sane mature adult who knows to make my choices in life. Any human being has a choice to wear or do what he/she wants and that's what I've been doing. Hence, kindly don't make your own judgements without understanding the exact situation #freedomofchoice."